Our 2014 release, MOKSHA, has been nominated for Best World Album in Zone Music Reporter’s 11th Annual ZMR Music Awards. Moksha, is a collection of recordings made in 2001-03 and produced on the Simla House® label.The recording is the third in Ray’s Indo-jazz fusion recordings for the label (after “Sum and Kali”, and “Raga Jazz”). With Ray Spiegel on Vibes and Tabla, Moksha features American Sarod (Lute of India) master Stephen James, Sarangi by Pandit Ramesh Misra, Ira Coleman on bass, Tani Tabbal on drums, and Barun Kumar Pal, Hansa Veena. The music is based on North Indian classical traditions. 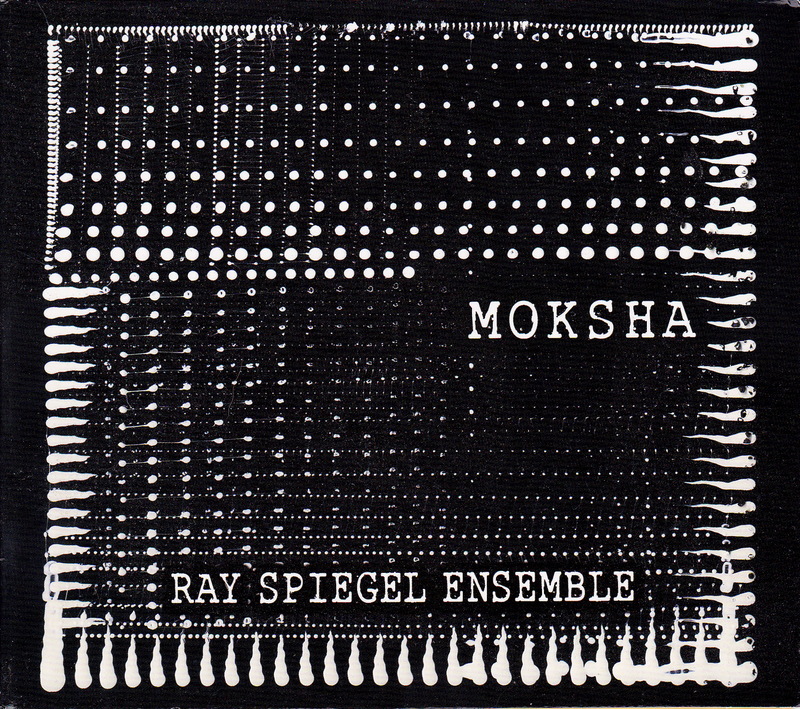 The Ray Spiegel Ensemble blends this with bass and drums for a unique blend of east and west. 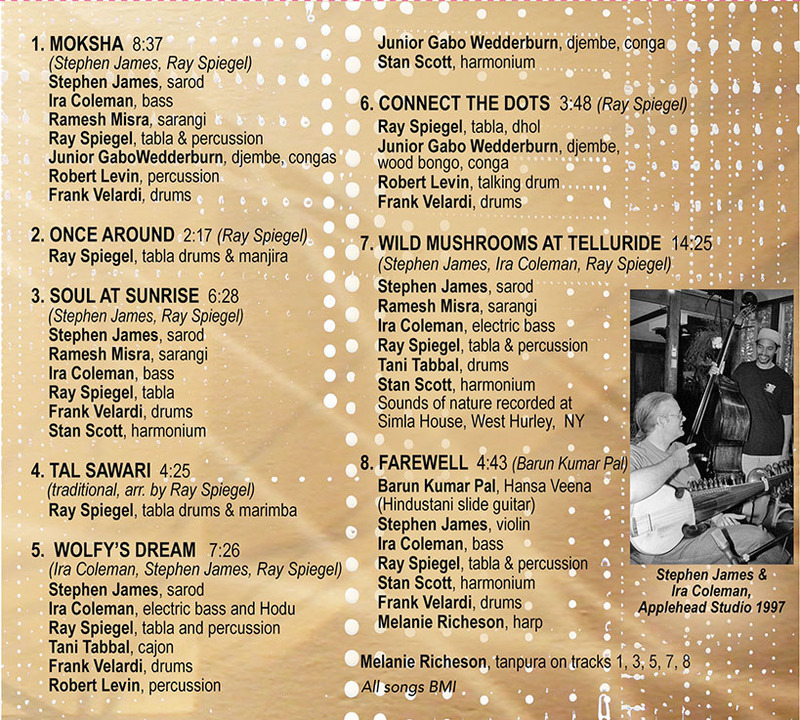 Influences are jazz, Latin, rock, soul, bhangra, and kirtan. … All of the artists contributing to Moksha should be very proud of what they have put together. An album of rich culture and diversity, it speaks to Classical Indian techniques and instruments, but goes one step further in breaking down the barriers between the past and present. Jazz infusions blend with classic sound to create new landscapes for listeners to enjoy. Elements of Bollywood and street pieces intersperse with Afro-Cuban, Indian Folk and more. I for one feel privileged to have come across this remarkable album. If you will excuse me, I think I want to go listen to those popping little mushrooms again. Catchy little things. If you enjoy a window into world music at its best, try Moksha. … Anyone who appreciates Indian or World music, and percussion in particular, will love Moksha. The level of musicianship is exceedingly high throughout, and I was often blown away by the incredible speed, dexterity, and mastery of Ray on the tabla drums. But equally impressive was the intricate interplay between the various instrumentalists. The Ray Spiegel Ensemble puts their own unique spin on Indian music that is charged with creativity and the integration of non-Eastern elements that make for an exotic listening experience. This entry was posted in Fusion, New Releases, News, Simla House CDs and tagged CD, Moksha. Alternatively, you may download the MP3 album from Google play or from CDBaby.